When Florian Kaps, one of the founders of The Impossible Project, tries to explain just how they've managed to reinvent instant analog film -- the type that works in Polaroid instant cameras -- he says that he limits himself to using the word "magic" only five times per presentation. By his count, he's managed to keep it down to four. Had he put a limit for himself on another word, it would have been "crazy." Kaps, (pictured) the project's head of marketing and distribution, uses that one far more than four times, to describe himself, to describe his whole team, to describe the former Polaroid employees in Enschede, Netherlands, who almost without reservation said "yes" when asked to join this passionate group on a -- yes, crazy -- project that had a high likelihood of failure: re-engineering almost from scratch the film packs that work in the 300 million still-functional Polaroid cameras which can be found in cabinets, shelves, attics and eBay listings worldwide. Magic craziness doesn't work very often in business, but perhaps that's because so few companies allow the crazy magicians to do their work unhindered. At The Impossible Project, mild forms of insanity mix with enchantment in a way that has thrived despite everything. Some of the upshot of that thriving are displayed on the high, white walls of the spare offices of Impossible New York: the most charmed results of Polaroid artists' shots taken with a test version of the new PX 100 film. Kaps opens a pack with a flourish after Head of Research and Production André Bosman explains a little bit about the film's complexity. He takes a photo of Bosman with his stylish old SX-70 to the sounds of cheers, applause and the clicks of many other camera shutters (digital, video, 35mm, perhaps a Polaroid or two). On Thursday, the black-and-white film will go on sale, along with the PX 600 version to fit 600-style Polaroids, for $22 a pack. This reinvented photographic magic is different than that made, up until 2008, by the company which now calls itself PLR IP Holdings. That old magic included chemicals made just for Polaroid which have since been discontinued entirely. For example, a special sort of titanium dioxide which was made only by a DuPont plant in DeLisle, Miss., was wiped out by Hurricane Katrina. "Color film," says Bosman, "has to ripen, mature, develop the flavor for two years, like a wine. There was no wine." There was no wine, because in 2006, Polaroid's management could only see the downward slope of the instant film's sales figures. Kaps had argued in great detail that production and sales expectations should be adjusted to reflect how the photography world had changed. His arguments were supported by sketches of how the company's last operating factory could work and his estimate of the market's bottom -- 10 million film packs a year. Yes, said Kaps, the digital revolution had swept the 35mm film world by storm and had nearly wiped out the use of Polaroid cameras for casual snapshots. Yes, the economics of the market had changed so that only artists and creative hobbyists found it worth the investment of more than a dollar per image. But that niche market existed, and its citizens were loyal to the iconic film in ways Polaroid's management (in constant turmoil since the late 1990s, with two bankruptcies and "a reorganization every year") could not comprehend. Polaroid decided it would shutter its Enschede plant when its 10-year lease expired in early 2008. Bosman, (pictured) who had been the head of the factory, says he felt "a mixture of sadness and relief" when he was told the news. Sadness because the film was a technological wonder, and a market for it still existed, if not at the 100 million film-packs-a-year level of production it had in 2007. Relief because it had been such a hard road. Every year from 1999 until the decision to close the factory, he'd had to let go long-time employees he considered part of his family. It had been painful each time, something like a disinheritance. At least, he said, "if you close the plant, you go home together." 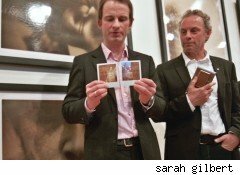 In February 2008, Polaroid held a closing ceremony for the factory. Bosman had been told he would destroy the machines, though plans to tear the factory down to build a housing complex had been derailed by the worldwide collapse of the real estate market. Talks with other companies, like Ilford Harman Technology, to take over the equipment had failed. "The machines were intimidating," said Rod Parsons of Harman. "We would have had to transfer them all from the plant in the Netherlands to the U.K. and start basically from scratch." The British film company had declined to pursue it further. At the last minute, Kaps had contacted Polaroid from Austria with the idea of taking over the lease for the building, buying the equipment and starting the machines up again, despite it all. Management had humored him a little -- said he could come to the ceremony -- then told Bosman to meet with him and give him a categorical message: It could not be done. "It was impossible," Bosman remembers. On the day of the ceremony, he looked around for this Florian Kaps person, and saw one man he didn't know: A man with a ponytail, wearing the look of someone who believes in impossible things. The two shook hands and that was as good as any contract. No, better. "We continued talking to late in that night and into the next morning," said Bosman. "And then, I went to the demolishing team and told them not to do it." The soon-to-be-ex-employees, all of whom had been at the factory for many, many years, were stunned: The factory had been headed towards closure for two years; now, at the eleventh hour, were they really being given a reprieve? Two weeks later, as Bosman and Kaps and a few others furiously began work contacting suppliers and potential partners and sussing out the probability of making a go of their plans ("The chance that we would fail was huge," Bosman says), the management at Polaroid got fed up. "Stop this crazy work, or hand in your resignation!" was the message from corporate headquarters. Bosman handed in his resignation, and the look on his face when he describes that moment is like flying: "The feeling of handing in your resignation after having been waiting for it for so long as a victim," he says, "is a feeling of power. I was back in control of my life." Kaps and Bosman eventually convinced Polaroid to let The Impossible Project have the building and the equipment. They and a third partner, Head of Finance and Administration Marwan Saba, hired eight other employees back; between them, they had 300 years worth of experience running the machines. Over two years, they worked to recalibrate the fantastically complex piece of technology that is instant film. Not only does each piece of film have six distinct layers (mask, receiving sheet, developer, negative, rail, mash), but each layer is made up of six or eight or 10 components, each of which must be used with extreme precision. If your proportions are as much as 0.05% off, says Bosman, the whole thing is useless. 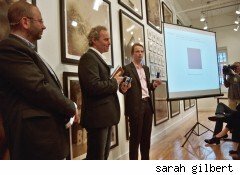 "Photographic materials are extremely sensitive," he says, displaying on a projector (for instance) the many parts of that "mask" layer, which include COF lacquer, white ink, primer, metalised PET, heat seal, and anti-static layer. "That's pretty difficult. But," he pauses, "we got it right." "We Want You to Feel the Magic"
"Right" is, to begin with, two types of black-and-white film, which the press event attendees immediately began testing with something between reverence and hedonism. PX 100 and PX 600 will, in the summer, be joined by color versions to fit both SX-70 and 600-type cameras. About 1 million film packs will be produced in 2010; over the coming several years, that production will increase to 10 million a year, a level both Kaps and Bosman agree is still the size of worldwide demand. There are other things, marks of the whimsy and joy and freedom that is engendered by marrying magic, craziness and some serious brilliance. Instead of expiration dates, the new packs will be marked with production dates. "It's a little like a wine," says Kaps. "There is a lot of handwork; it's slow production." Each vintage is unique and who can say when a wine is done for? You have to taste it. The blank plastic sheets that come out of the camera when you insert a new cartridge are imprinted with quirky sayings: The one Kaps produces reads "Smells like teen spirit." Others quips include "Explain the color orange" and "Dance without money." The film looks blue when it comes out of the camera, instead of white like the old Polaroid film. "We don't want to copy," Kaps says. When there are mistakes, when a film run doesn't go as planned or the team devises a new "flavor" of film that doesn't seem quite right, these will be sold anyway. "We don't want to tell you how to feel!" says Kaps. "We want you to feel the magic on your own. (That's the fourth time I used the word 'magic'.)" The best results from Polaroid cameras are often described as having a luminous quality, as if the light source is otherworldly. These images do not disappoint. They glow with a silvery sheen, part of the chemistry of the films. But the film is more sensitive to heat and, as the photo develops, direct light, than the original Polaroid products. For best results, Kaps suggests, a photo should be put in your pocket for a few minutes after emerging from the camera. And the probable results of shooting in the cold, Bosman remarks, will be photos that are almost whitewashed. A test pack shot by a British photographer demonstrates just how sensitive this new film is. The images taken outside in the cold are mostly white; inside shots manipulated through pressure ("caressing," Kaps calls it) during developing are the most "viewable." 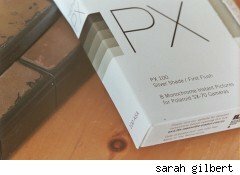 As Olivier Laurent writes, "my initial impressions are that PX100 behaves like a expired pack of 669 or Time-Zero. You're never sure of what you will get." Update: I believe this to have been an aberration; I shot another of the packs handed out at the press event, and though I was only just learning how to use the ancient SX-70 I'd bought on Etsy, I was able to get photos that were quite lovely; other photographers have yielded spectacular shots. It's a film most surely intended for use by those photographic artists who have learned to trust the hands which chance and chemical processes have dealt them. The film will be available starting Thursday for purchase in the U.S., Canada and Europe via the Impossible website. A few retail shops will begin carrying it next week, and more will come on board as the team develops distribution agreements. As soon as the company can offer the film in Asia with the same prices and shipping times as the U.S. and Europe, it will; Kaps is very stern when it comes to international equality. But the rest of the time, he and his team are animated: They smile until the joy reaches their ears. They are "a little proud," Kaps says. No, not a little. This is the sort of pride in one's craft that you almost never see anymore. This is crazy!